and treat water for long term storage. 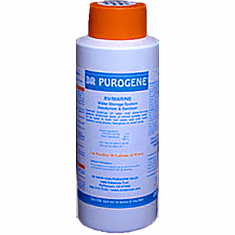 Purogene destroys existing bacterial colonies and prevents the developing of new ones. Purogene gets rid of bad odor and bad taste in stored potable water. Use Purogene water treatment for good and natural taste in drinking water, and as well as good taste in prepared drinks. Destroys deadly microbes, bacteria, parasites and viruses in water. This 1 gallon size. Bottle of Purogene will treat 3,840 gallons and makes the water safe to drink for an extended period of time. 1. 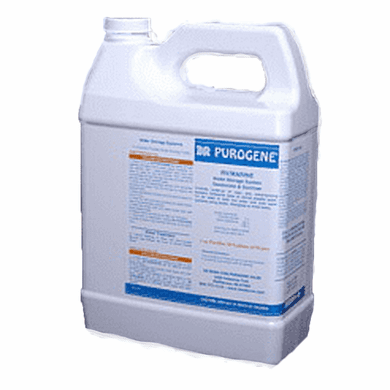 Put 1 ounce (2 tablespoons) of Purogene for each 30 gallons of container capacity into the container. Fill the container with potable water and seal it air tight. 2. Store the container out of sunlight and in as cool a place as possible. The water stored must be potable (safe to drink). Low mineral content water is preferred (reverse osmosis or distilled). Water should be bacteria free and free of organic materials. This treatment is NOT meant to purify unclean water, but stabilize already clean water. Containers that are not completely opaque and are stored in a location that might be exposed to even a small amount of sunlight. The Plastic Container must be covered with a completely opaque cover (such as heavy gauge blue plastic liner). Exposure to sunlight will deteriorate the Purogene and render it ineffective in microbial control. as well as control the build-up of slime and odor-causing bacteria in any drinking water system in RV units, campers, trailers, and boats. Water treatment to control the build-up of slime and odor-causing bacteria and enhance the taste of stored drinking water. Drinking water should be treated at a rate of 1 fl oz (2 tablespoons) of 3R PUROGENE per 30 gallons of water (5 ppm ClO2 concentration). This treatment will provide bacteria growth control, fresh taste and odor control to the water. Treat each new-addition-of drinking water to the fresh water tank at the ratio of 1 fl oz (2 tablespoons) of 3R PUROGENE per 30 gallons of drinking water. Treat as often as necessary to maintain fresh taste and odor control. Containers: Water containers must be free of oil, detergent, ammonia, and organic contaminants. Do not use steel containers with exposed metal which will come in contact with the stored water. If you do use Steel drums, they must be plastic lined. See our Epoxy Phenolic Lined Drums. 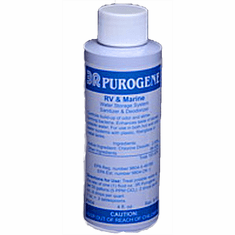 Place 1 fl oz of 3R PUROGENE per 10 gallons of water tank capacity into a clean plastic or glass container. To this add 1 tsp of Citric Acid Activator Crystals (lemon juice may be used, same amount) and let it stand for 5 minutes. DO NOT breathe the fumes! Pour the sanitizing solution into the water tank and fill the tank with potable water. Turn on the water pump and drain a small amount of water from each of the faucets including hot water faucets so that the sanitizing solution gets into the entire system. Refill the tank with potable water to replace drawn off solution. Let the system full of sanitizing solution stand for at least 1 hour. After the hour, drain the tank and refill with potable water treated with 5 ppm of ClO2 as described above. Draw off some water from all faucets including the water heater tank to purge the sanitizing solution. To maintain the tank, repeat this procedure as often as necessary. Question: Is this the same thing as Bleach. By Jim R.
Answer: No! This is chlorine dioxide Which is used worldwide as a water purifier. I really was shocked and thrilled this worked! I have a plastics guy that works on RV water tanks and he recommended it for a tank we could not get clean! I followed the directions and left ovenight and it worked! No more bad taste or sulfer smell!!! So pleased!